Dr. James Pedlar examines the disunity of the contemporary Church as well as the need for reconciliation in the Church's identity and mission. James Pedlar joined the Tyndale faculty full time in 2013, having previously taught at Tyndale and Booth University College on a part time basis. James loves teaching and is passionate about helping students understand how Christian theology has developed in response to the challenges that the church has faced throughout its history. James is a Wesleyan theologian whose work focuses on ecclesiology – especially questions involving the place of renewal and reform movements in the church. 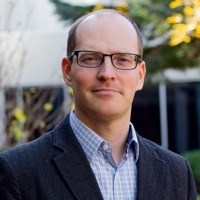 His doctoral dissertation explores the use of the Pauline concept of “charisms” as a way of thinking about the unique gifts that different movements bring to the life of the church as a whole. He has published articles in The Asbury Journal, Ecumenical Trends, and Ecumenism. James is a Lay Minister at Wesley Chapel Free Methodist Church in Scarborough, where he leads worship and preaches regularly. He has previously served with The Salvation Army, both as the director of a Canada-wide research project on young adult attrition, and as Community Ministries Director in the Quinte Region of Ontario. He also served on the staff of the Commission on Faith and Witness at the Canadian Council of Churches.